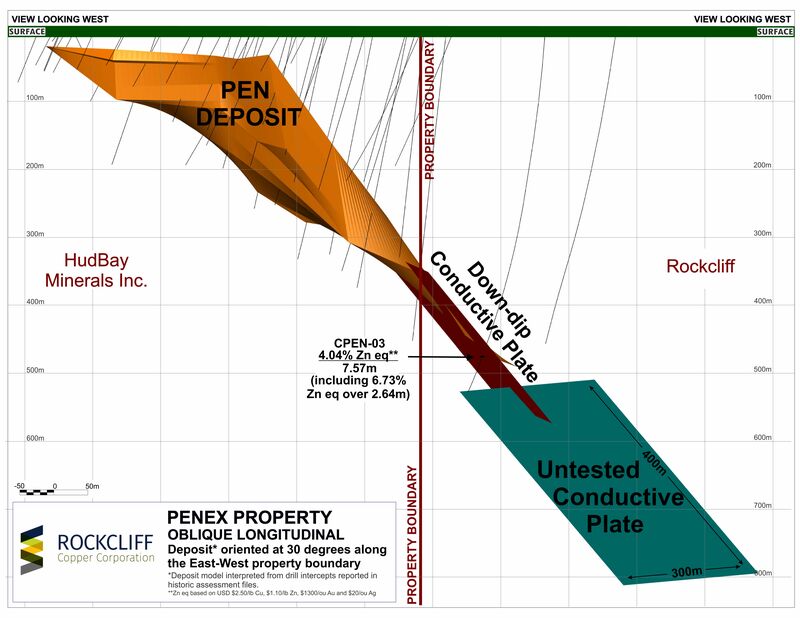 Rockcliff Copper Corporation ("Rockcliff" or the "Company") is pleased to announce that its recently completed surface geophysical survey has identified a large untested conductive plate below the historical Pen Zinc Deposit that is partially located on the Company's 100% owned Penex zinc property (the "Property"), Snow Lake, Manitoba. The Property is strategically located approximately 4.5 kilometres southwest of Hudbay Minerals Inc.'s ("Hudbay") high-grade Volcanogenic Massive Sulphide Lalor mine and less than 200 metres from Hudbay's up-dip near surface portion of the historic high grade unmined Pen zinc deposit. The Property hosts the down dip continuation of the Pen zinc deposit and is part of the Company's Snow Lake Project, one of the highest grade base and precious metals property portfolios in North America. Ken Lapierre, President and CEO of Rockcliff commented, "In exploration, geophysics is crucial in discovering buried conductive plates that could end up becoming high grade base metal mines in the Flin Flon-Snow Lake mining camp. We are fortunate to have acquired 100% interest in the Penex Zinc Property by staking. The Property covers the down dip continuation of the high grade Pen Zinc deposit where it crosses onto our Property at approximately 300-350 metres vertical. With our geophysical survey identifying a strong untested conductive plate immediately below the known deposit and continuing to at depth of at least 800 metres vertical bodes well for high grade zinc mineralization to continue on the Property. We will continue to explore and prepare the Property for a planned drill program in 2017." The high grade Pen zinc deposit hosts multiple zinc-rich lenses, strikes northeast-southwest and dips/plunges northwest. The deposit is located less than 200 metres on surface from the Property's southern boundary. All lenses of the Pen zinc deposit dip towards the Property's southern boundary and at least one of the zinc-rich lenses dips and plunges onto the Property at a vertical depth of between 300-350 metres. The deepest historical drill hole (CPen-03) on the Property intersected the deposit at approximately 475 metres vertical. The hole assayed 6.7% zinc equivalent across a down the hole thickness (not true thickness) of 2.6 metres within a much thicker zinc envelope of a down the hole thickness (not true thickness) of 7.6 metres grading 4.0% zinc equivalent. Bore hole geophysics completed in drill hole CPen-03 and now in surface geophysics have confirmed that the deposit's conductivity continues downward on the Property below the hole and was strengthening at depth where the deposit remains untested by drilling. Ken Lapierre P.Geo., President and CEO of Rockcliff, a Qualified Person in accordance with Canadian regulatory requirements as set out in NI 43-101, has read and approved the scientific and technical information that forms the basis for the disclosure contained in this press release.